A splashing good time for your dogs! Safety is our top priority when engaging in any fun activities. We offer supervised swims by our trained handlers to ensure that your pup is having a good time while under our careful watch. 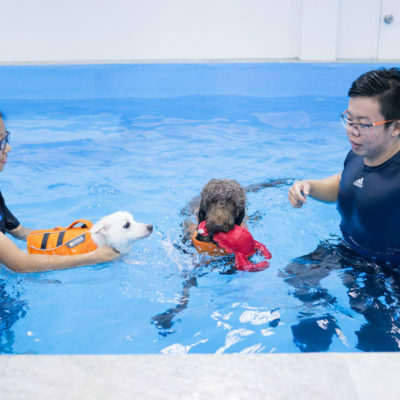 All dogs are required to put on lifevests while swimming and frequent breaks are given to your pup to ensure they are exercising within their range of fitness level. Swimming is a fun activity that adds colour and confidence to your dog’s life. Natural swimmers will be able to have a good dip, paddle and splash at our indoor pool. 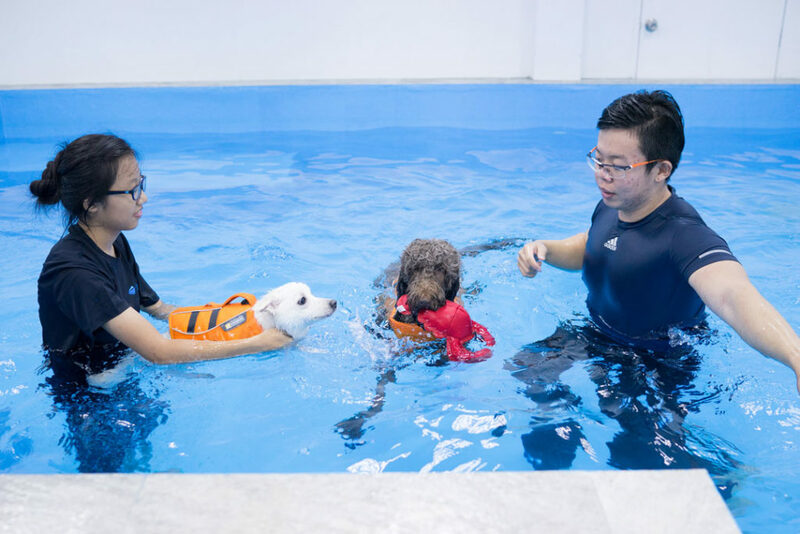 For dogs that are learning how to swim, our patient handlers will be assisting your dog to gain water confidence gradually. Don’t be surprised if your dog starts barking for more water fun! Swimming is good for fitness, body conditioning and a great source of aerobic exercise that has low impact on your dog’s bones and joints. It is a great tool to help your dog stay in optimal shape and maintain a good fitness level. Active dogs are able to expend their energy during swims and will be calmer after the fun workout. Other benefits include weight management, strengthening of muscles, greater confidence and much more! We feature an air conditioned 25 Sqm pool with a self serve dog wash facility. Playdates are no longer an issue be it rain or shine. There’s also an area for you and your friends to chill while you watch your dogs having a great splash time. 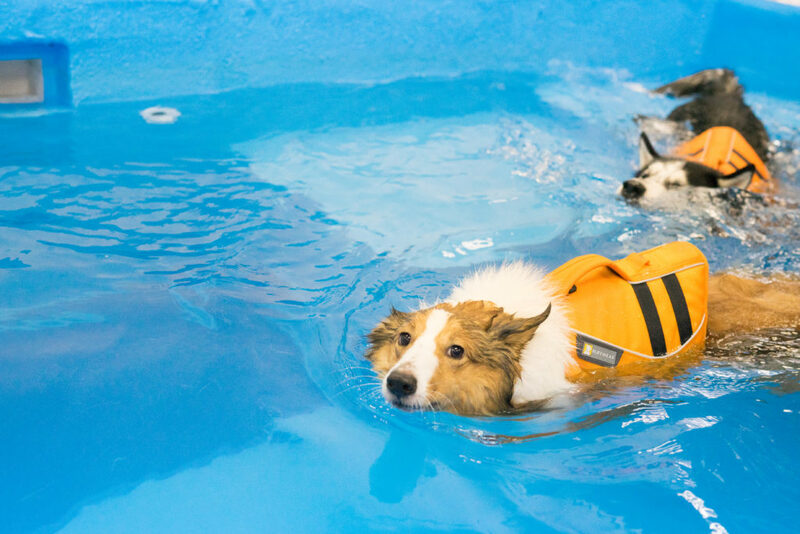 Ruffwear floatcoats are also available at $3/piece to aid your dog to have more confidence in his swim. Another great weekend awaits you and your dog! We feature an air conditioned 25 Sqm pool with a self serve dog wash facility. Playdates are no longer an issue be it rain or shine. There’s also an area for you and your friends to chill while you watch your dogs having a great splash time. 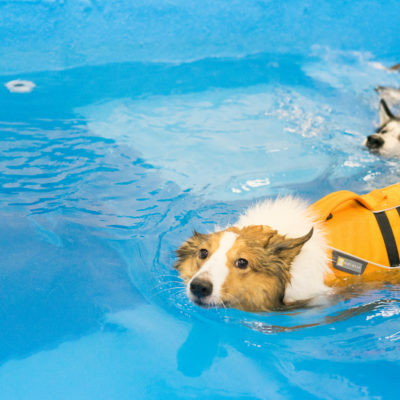 Ruffwear floatcoats are also available for rental at $3/piece to aid your dog to have more confidence in swim! Another great weekend awaits you and your dog! For supervised swims, please take note post swims dogs will be 70% dry. If you would like your dog to be fully dried and fluffed up, you may opt for our bath and fluff option. We offer 20% off our bath and fluff with every supervised swim. All packages are valid for 2 months. All dogs must present annual vaccination records prior to the fun swim. Bookings has to be made a day in advance. Slots allocated are on first come first serve basis.